Delight your friends, family, and loved ones with our hippo ornaments for the holidays.� We've got new selections every year, along with oldies but goodies from past years. Some of our customers love their ornaments so much they keep them up year round! Ornaments make great gifts for everyone on your gift list, including those hard-to-buy-for coworkers and neighbors. Our hippopotamus ornaments range in price, size, and materials, but are sure to please even the person who has everything. Grinning metal hippo with tie and jaunty hat will brighten your Christmas tree with his happy cheer. He sports a heart on his flank, just to show you how much he loves you. The handmade holiday ornament has two tones of silver and copper. Ornament measures about 3" x 3". Fair trade, hand-made ornament. Ms. Hippo, adorned in a �berry� beautiful holly wreath necklace, is the perfect accent for your holiday tree or winter celebrations. She has a hint of sparkle, is formed in resin and measures about 4� long x 2� tall. Hang this one on your Christmas tree or on any display stand for a sure hit. The stone resin teacup has a darling hippo peaking out and is hand painted with pine cones and holly. 2 1/2"� x 2"
Lifelike roaring hippopotamus figurine is a fun holiday gift for any hippo lover in your family. It makes a great stocking stuffer or small gift item for a favorite co-worker. He can also be used to decorate a gift package; just attach him to the bow and present your gift. Also makes an ideal gift choice for children, friends, or classmates. The hippo is made of painted hard plastic and measures about 2.2" long. Happy metal hippo roller skates around your Christmas tree with this handmade holiday ornament. Two tones of silver and copper are accented by red beads. Ornament measures about 3" x 3". See our companion ornament, the Ice Skating Hippo Ornament. Cute, shiny hippo ornaments will brighten your Christmas tree or holiday display! Measures about 3 1/2" long and is made from shatter resistant plastic. Please choose from green, silver, gold, red, or blue. Hit the slopes with our super cute skiing hippo ornament in pink with glittery blue hat, scarf, and the most sparkly skis and poles you've ever seen! She'll bring a smile to the face of anyone admiring her. 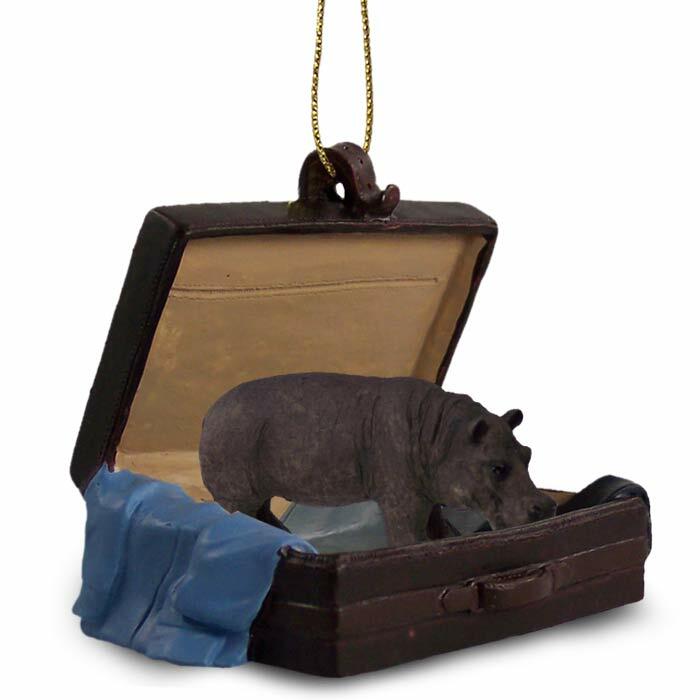 This ornament makes a wonderful gift item for skiers or hippo fans. 3" x 4"